I'm sorry that Smilie isn't doing very well. We do what we can. Were you able to check out his ground temps? Please keep us in the loop. Have you tried covering both sides (and the back of the enclosure) with brown paper from shopping bags? This is from my blog whats your advice? Hello Aliza for being on my friendship list you are awesome when it comes to giving out advise. Hey hun how are ya ? Interested in Hemi Triedrus ? I got a male to trade . Please respond to my e-mail address. and thank you again. If you care to, you can also direct me to people who can advise me. I appreciate it. Hi this is Banded Gecko from New Mexico by the Texas border in Carlsbad. I found a Banded Gecko recently, about 4 or 5 months ago. I have been buying tiny crickets but I have never seen it eat. It is still alive. I am afraid it will die. 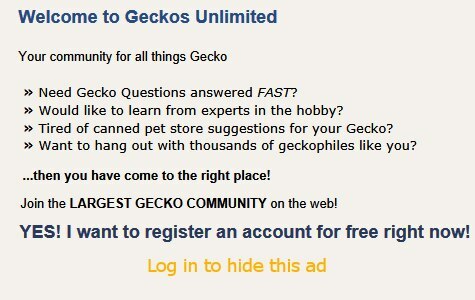 I found you because you responded to someone wanting to identify a found gecko, and it is exactly like mine. Should I let it go. I love the animal but I am afraid for it. I would not mind selling it to someone either. Please advise if it will become more active in the spring. Thank you very much. 03:42 AM - Geopard Lecko mentioned acpart in post Think I'm getting close to having some eggs! 10:52 PM - Geopard Lecko mentioned acpart in post Think I'm getting close to having some eggs! ...62 grams. thoughts acpart ? or anyone else? 03:39 AM - Geopard Lecko mentioned acpart in post Made my own hatchling rack + got some supplies and an incubator! ... Elizabeth Freer acpart what do ya think? 12:36 AM - Elizabeth Freer mentioned acpart in post Pie's Progression Thread! 01:34 AM - catflint mentioned acpart in post 3 mo. old gecko dull colors after 2 weeks- stress or shed? 04:22 AM - Elizabeth Freer mentioned acpart in post Baby Leopard Gecko Turning Pink ... ? 03:48 AM - Elizabeth Freer mentioned acpart in post Which commercial incubator is best for small breeding set up? 08:35 PM - cmerchant1598 quoted acpart in post Young leopard gecko: never coming out of moist hide. 08:08 PM - acpart quoted IHaveNoIdea in post What is Echo? 10:57 PM - Geopard Lecko quoted acpart in post Think I'm getting close to having some eggs! 07:51 AM - njrmdrsj quoted acpart in post Please help. I don't know if our gecko Thunder is impacted. 01:29 AM - Geopard Lecko quoted acpart in post Think I'm getting close to having some eggs! 12:22 AM - Elizabeth Freer quoted acpart in post Think I'm getting close to having some eggs! 11:53 AM - Geecko123 quoted acpart in post What morph am I? And what's wrong with me? 10:50 PM - acpart quoted Geopard Lecko in post Think I'm getting close to having some eggs! 12:05 AM - Geopard Lecko quoted acpart in post Think I'm getting close to having some eggs! 11:10 PM - Scoob quoted acpart in post Stuck Shed? 01:18 AM - Geopard Lecko quoted acpart in post Think I'm getting close to having some eggs!